On a beautiful Minnesota summer evening, before the mosquitoes hatch, come to a music and spoken word show on St. Paul’s famed University Avenue. 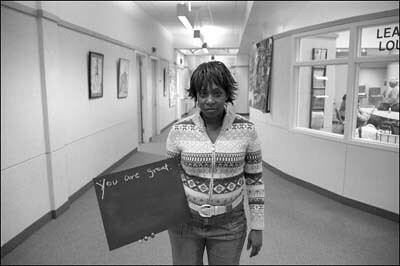 Wing Young Huie’s University Avenue Project, sponsored by Public Arts St. Paul, will hold its first of five monthly cabarets, followed by the nightly projection of Wing’s photographs. Come hear Master of Ceremonies Jade Tittle, host of 89.3 The Current, introduce acts including spoken word artist Tou Saiko Lee and musicians Heatherlyn, EJ, Erik Brandt, Lindsey, Kristoff Krane, and The Pachamama Band. Also, check out the MHS Press book on this spectacular public exhibit. 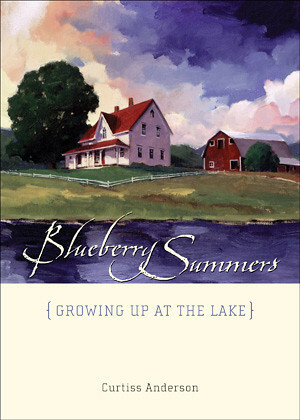 We were just informed that Curtiss Anderson, author of Blueberry Summers: Growing Up at the Lake, passed away last weekend. Anderson was a prominent editor with Hearst Magazines. Our condolences to his family and friends. For a flavor of Blueberry Summers, click here. Are you on Twitter? More and more we start and end our day with a Tweet Roundup, a quick look at all the news of the day, including especially news of the book and Minnesota’s literary scene. 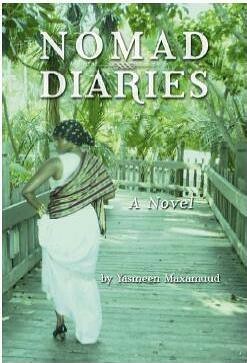 Somali-American writer Yasmeen Mavamuud will be at the Loft Literary Center in downtown Minneapolis this Saturday, May 22, at 3:00 to discuss her book Nomad Diaries. Nomad Diaries chronicles the lives of Somali-Americans, the trials and tibulations, successes and joys, of builing a new lives for themselves in the United States. 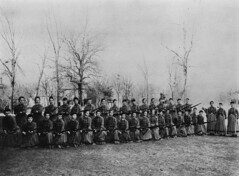 For more information, check out the Nomad Diaries website or this review from the Star Tribune. While the book is set in Minneapolis, Yasmeen Maxamuud actually lives in San Diego, so don’t miss this opportunity to meet her. Place trout fillets in a glass or ceramic dish, and cover with buttermilk. Cover the dish with plastic wrap, and refrigerate at least 2 hours. Remove fillets from buttermilk, and discard liquid. Mix bread crumbs, cornmeal, and lemon pepper in a large bowl. Dredge fillets through bread crumb mixture, and set aside. Melt ½ cup (1 stick) of the butter in a large skillet over medium-high heat, until bubbling. 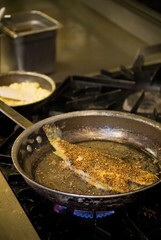 Add breaded trout, and cook undisturbed until bread crumbs only begin to brown, about 3 minutes each side. Remove fillets, and hold in warm oven. Heat ¾ cup (2½ sticks) of the butter in the same skillet until it just begins to smoke. Remove the skillet from heat, add lemon juice, and set aside. Melt remaining ½ cup (1 stick) butter in a medium skillet. Crack eggs into the skillet, and whisk to break yolks. Add heavy cream, and stir with a rubber spatula until eggs come together. Remove from heat, and season with salt and pepper. To serve, place 1 fried trout fillet on each plate. Divide eggs, placing one-quarter of the eggs on top of each trout fillet, and then drizzle with burnt-butter sauce. Makes 4 servings. Tim Brady tells the amazing story of “The Broom Brigade” in his Gopher Gold: Legendary Figures, Brillian Blunders, and Amazing Feats at the University of Minnesota. Participating in the festivities is Odd S. Lovoll, professor emeritus of history at St. Olaf who writes extensively about the Norwegian American experience. 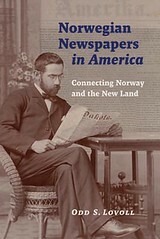 His newest book, Norwegian Newspapers in America, is a comprehensive look at the Norwegian-language press, celebrating the tireless writers, editors, and publishers whose efforts helped guide Norwegian immigrants on their path to becoming Norwegian Americans. Next week, celebrations of Syttende Mai (May 17, Norway’s Constitution Day) will also be held at St. Olaf and St. John’s Lutheran Church in Northfield. Explore the streets of Minneapolis before a Twins game, after a matinee performance at the Guthrie, or before dinner at Barrio with architectural historian Larry Millett’s new walking tour guidebook, AIA Guide to Downtown Minneapolis. The book features walking tours for Nicollet Mall, the Warehouse District, the central riverfront, and the Elliot Park and Loring Park neighborhoods. Maps, photos, and behind-the-scenes details on the structures and their architects are packed into this slim volume sized to fit in your backpack. Join Larry Millett tomorrow, May 11, at 7 p.m. at the Mill City Museum for a free illustrated talk about the unique architectural history of the Mill City. Do you miss Lily the bear and her cub, Hope? Get your Minnesota wildlife fix at Ron Schara’s Minnesota Bound Loon Cam. Check out the site for links to Larry’s blog and the Loon Cam’s Facebook page!